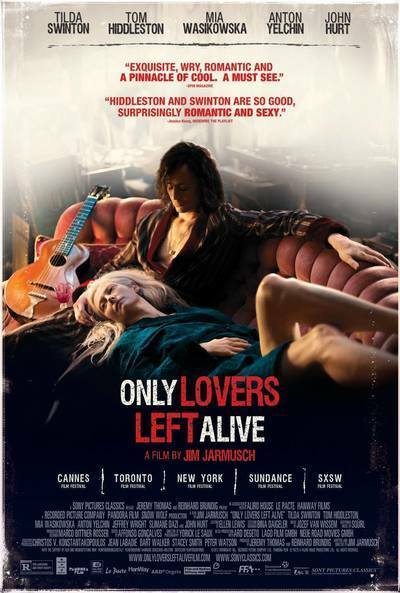 Pasty pin-up boy Edward Cullen and his undead clan can’t compete with the fabulously aloof and effortlessly cool creatures of the night lurking in Jim Jarmusch’s "Only Lovers Left Alive". They don’t need the sun to sparkle. They are superstars illuminated from within. Not that Jarmusch’s denizens of the dark are so mundane as to be directly referred to as vampires during the course of this pleasurably droll and languorous soak in a pool of comical musings, nostalgic longing and sorrowful loss. They are more like supreme beings, too good for the mundane and crassly disposable 21st-century chaos that exists outside their carefully curated domains. The domestic fortresses where they doze during daylight hours are bursting with rare books, objets d’art, collectible musical instruments, exotic fabrics, ancient electric gadgets and other relics culled from the many centuries they have existed amongst us lesser mortals. Like most of Jarmusch’s films, the emphasis is not on action but interaction—especially the verbal kind. And atmosphere. Loads of atmosphere, down to the sounds of far-off howls and crimson-red Gothic lettering during the opening credits. As usual, his pacing is decidedly unhurried—the less kind might say sluggish—but it is made more than tolerable by the presence of a pair of exceedingly appealing lead actors. Michael Fassbender almost took on the role of Adam, a later-day Count Dracula who resides not in a Transylvanian castle but in a spooky dilapidated mansion on the rundown outskirts of Detroit. But lucky for us, Tom Hiddleston—whose passionate following is as devoted as Fassbender’s, thanks to his witty and wily Loki from the Thor franchise—has taken his place. With wavy dark hair cascading Veronica Lake-style over one eye and boasting a poet’s slim-hipped physique, Hiddleston is a much better fit as a woeful and weary loner who finds solace in collecting classic guitars and penning mournfully hypnotic mood music. The only thing that truly relieves his gloom is his spouse and soulmate, Tilda Swinton’s more upbeat Eve. This runway-ready vision in a fawn-hued apparel, sunglasses and leather gloves while topped by a tangled mop of beige hair resides across the globe in Tangier, but stays in touch with her Apple iPhone. Adam, Eve, Apple—get it? Despite the distance between them, Jarmusch cleverly signals their psychic connection to one another from the first scene when a spinning 45-rpm record fills the screen and rockabilly queen Wanda Jackson’s witchy wail resounds on the soundtrack. That hypnotic image dissolves into the sight of two reclining figures going round in a circle, seemingly in the same room yet miles apart. The story, such as it is, revolves around a concerned Eve paying her beloved Adam a visit, which requires booking a night-time-only flight and selecting just the right fake passport.Why they are apart is not fully explained, though we are left to guess it has to do with Eve’s close ties to Christopher Marlowe. Yes, that Christopher Marlowe, the Elizabethan tragedian whom some believe—including Jarmusch—wrote the plays attributed to Shakespeare. He, too, is a vampire but less than thriving. The conceit that he is still around, hiding out in Morocco and supplying fresh untainted blood to Eve comes a bit out of nowhere, but John Hurt invests both pathos and humor into the role. It is just one of the ways that Jarmusch, who with his legendary shock of white hair could be a cool vampire himself, allows his characters to toy with supernatural lore instead of over-explaining their lifestyles. Fearing contamination from feeding on humans directly, Adam, posing as "Dr. Faust," gets his supply of hemoglobin by bribing a hospital worker who goes by the name of Dr. Watson (Jeffrey Wright). He also employs the services of Ian (Anton Yelchin), a none-too-swift kid who may or may not have tipped off others about the existence of Adam and his underground recordings. Ian, who is a real bloodhound when it comes to fulfilling his master’s craving for rare guitars, doesn’t seem to question Adam’s nocturnal habits or the fact that his bathroom is perpetually out of order. The only time he gets suspicious is when his delivery of a Gretsch Chet Atkins gets Adam reminiscing about seeing rocker Eddie Cochran of Summertime Blues fame—who died in 1960—perform while using that model. Ian pipes up: "You saw Eddie Cochran play?" "On YouTube," quickly explains Adam, covering his tracks. It’s akin to Bela Lugosi saying, "I never drink—wine." The arrival of Ava, Eve’s brazenly bratty little sister who is given a mischievous spin around the seductive bloodsucker block by Mia Wasikowska, soon up-ends the order of their carefully maintained universe. But the best parts are when we get to witness the reunion of Adam and Eve, sipping blood in aperitif glasses or slurping it in Popsicle form, driving around the ruins of a downtrodden Detroit in a vintage sports car (when Adam mentions the Motown Museum, Eve begs off: "I’m more of a Stax girl myself") and sharing ancient memories of acquaintances past. I imagine this might be how David Bowie and paramour—and, later wife—Angie intertwined during the height of their passion. A couple of kooks hung up on romancing. "Mary Shelley—what was she like," inquires Eve about Adam’s friend who wrote Frankenstein. A look of fondness flashes in his eyes as he responds, "She was delicious."